Portland – I bookended my trip in Portland, where I’ll be heading again next year for the Women in Travel Summit. My first stop was The Francis, a new boutique hotel that was once a funeral home. I had a lovely stay there, and I got to sample a bit of Portland’s impressive food scene while I was in town – breakfast at Tandem and dinner at Pai Men were both very memorable experiences. I also did some sightseeing at the Portland Art Museum, Maine Historical Society and the Wadsworth-Longfellow House. 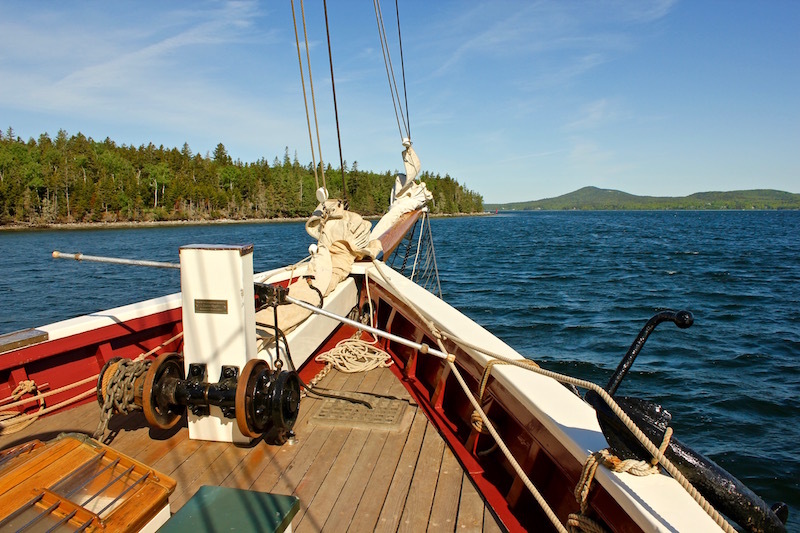 Penobscot Bay – The main reason for my trip to Maine was to sail on the schooner windjammer J.& E. Riggin out of Rockland. We spent the first night on the boat in Rockland then three nights out in Penobscot Bay, with stops at Warren Island and Castine. The windjammer is owned by Captain John and Chef Annie, a husband-and-wife team who made every member of our group feel like family. It was one of the most memorable travel experiences I’ve ever had. Not only is the scenery stunning, but the company was a lot of fun and the meals were spectacular – Annie cooks everything from scratch in the tiny galley kitchen! Rockland – I had never been to Rockland before, and I ended liking it so much I decided to stay an extra night. My first stop after getting off the boat was 250 Main, Rockland’s newest hotel that also doubles as an art gallery. I had a gorgeous room – complete with a private roof deck! – and I loved checking out the rooftop garden as well as the complimentary happy hour. I had some fun meals in Rockland too – at Ada’s, Cafe Miranda and In Good Company – and I even found a winery to visit, Breakwater Vineyards, which was a pleasant surprise. I also toured several of the local attractions – Farnsworth Art Museum, Center for Maine Contemporary Art, the Owls Head Light, and the Owls Head Transportation Museum. The Coastal Maine Botanical Gardens – On the way back to Boston I swung by Maine Coastal Botanical Gardens on the Boothbay peninsula, and I’m certainly glad I did. There are more than 300 acres to explore, and there is so much to see beyond the impeccable flower beds including sculptures, fountains, a butterfly pavilion, and an impressive Children’s Garden which has brought gardens from seven childhood books to life. After returning from Maine, I was only back in Boston one day before leaving again. This time, I traveled south to New Jersey to spend some time with my parents and extended family for Father’s Day. My dog Lucy has been staying there with my parents during all of my travels, and since I’ll be stateside for a while, I brought her back to Boston with me – I’m loving having her home with me again. 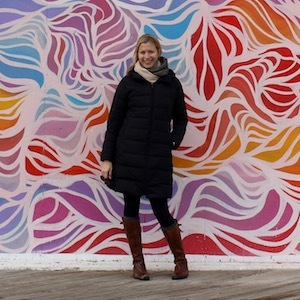 One of the best parts of blogging for me has been connecting with other like-minded travelers all over the world and being welcomed into a supportive blogging community. After returning from New Jersey, I hosted fellow blogger Brianna of Casual Travelist, who was in Massachusetts for work. We “met” through various blogger Facebook groups but this was the first time we saw each other face to face. (Fun fact: We went to rival high schools and even graduated the same year!) 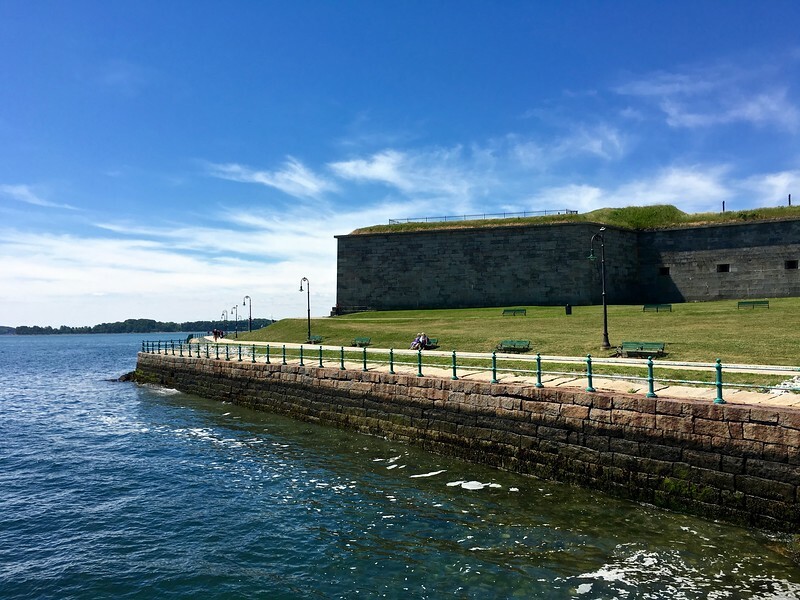 We spent the day in my neighborhood exploring Castle Island and had yummy tacos for lunch at Punk & Poet. It’s a little weird not having any significant travel plans right now after all of the non-stop traveling I did over the past year, but New England is not a bad place to hang out in the summer. I plan on reading, doing yoga, hanging out on my deck, and gardening (and catching up on blogging of course). And I look forward to welcoming my dad next week. We’ll be spending a weekend in Greenfield, Massachusetts, for the Green River Festival – it will be our 8th time attending together! It was so great finally meeting up with you, thanks for showing me around Southie! Anytime! Hopefully I can get down to Virginia Beach at some point!